How to avoid plagiarism in a web-based research? Here are Pro tips on avoiding plagiarism while writing. The word plagiarism should no longer be strange to you if you’re a member of the academic community. it is clear from this definitions that plagiarism is fraudulent. It involves stealing, lying, cheating and deceptions. These acts can get one in trouble. With the recent level of globalization and information technologies, easy access to information on almost anything has made acquiring knowledge quite easy. Researchers can now access what others had done in their area of interest. For many, the web is all they need to consult for their academic write-ups. This however, predisposes several unwary and lazy scholars to committing this academic crime. Giving the serious consequences of this unethical practice, students and researchers should be properly acquainted with what the practice entails. Its causes or factors that predispose them to it; it undesirable outcomes as well as how to avoid it. 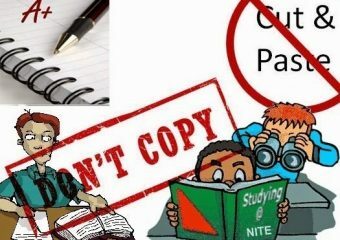 Having established that plagiarism is a crime, it is important to know its different forms so that as a good researcher with integrity, you will be able to stay clear of it. As a good student / researcher, you should demonstrate your learning ability by fulfilling your academic responsibilities to avoid the above listed practices. The goal of research is to engage, through writing, in a purposeful, scholarly discussion of issues. As a scholar, you should seek to understand , engage in dialogue with and challenge the work of others. These are the building block of a good research work. Copyright laws make it illegal to reproduce someone else’s intellectual property without permission. Anyone who reproduces copyrighted material improperly is liable to prosecution in a court of law. You can however borrow ideas and phrases from other sources provided you cite them properly. Simply acknowledging that certain materials has been borrowed and providing your readers with the information necessary to find that source will prevent plagiarism. Reasons Students Plagiarize or Cheat? Every phenomenon on the planet earth has a cause. The act of plagiarism is tracabable to a number of factors. It is important to mention that for some undergraduate students, ignorance is a major cause, as they are least aware of the crime of plagiarism and the grievous consequences that it attracts. They therefore freely download and sheepishly adopt articles from the internet and books for their assignments and projects. It should be noted that ignorance will not exonerate an offender from the consequences of a crime. So beware! Refusal to identify the fraudulent practices and enforce appropriate penalties by lecturers and institutions. As with other wrong doings, the degree of intent and the nature of offence determines its status. Institution punishment: Loss of job, denial of positions or demotion could result. Legal punishment: plagiarism is punishable by fines and sometimes up to one-year jail term. Having considered the characterization, causes and consequences of plagiarism within the academic community, there is the need to proffer a preventive and curative remedy for this unethical practice among intellectuals. This, in essence, will help those caught in this web to come out of it and conform to the ethical standard of academic writing. Can my readers tell which ideas belong to whom? Am I clear about how I used others’ ideas to my own contributions? Have I represented others’ work fairly in the context of my own? Where have I contributed something of my own to the discussion?